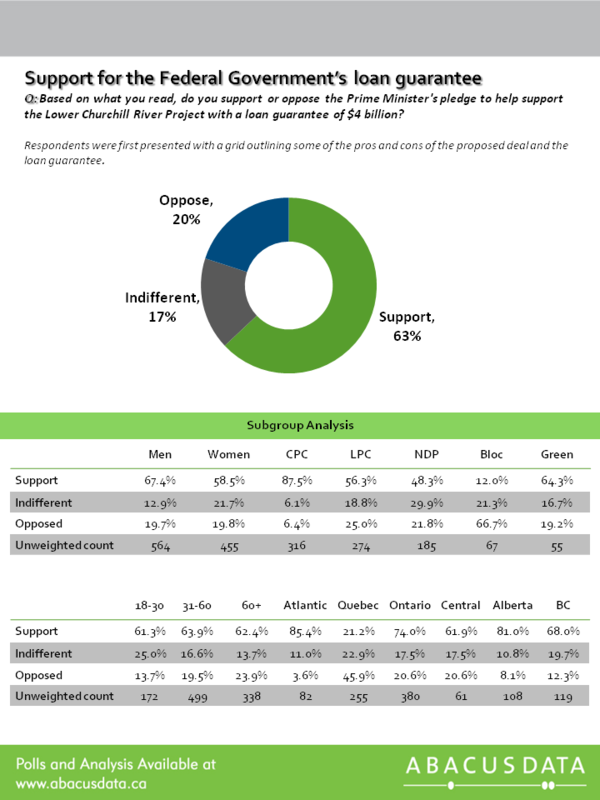 A new national survey by Ottawa-based Abacus Data finds that a majority of Canadians support the plan for the federal government to provide a loan guarantee of $4 billion to help support the Lower Churchill River hydro-electric project. Nationally, 63% of Canadians supported the plan to guarantee the loan, while 20% were opposed. Support was particularly strong in Ontario, Alberta and Atlantic Canada. Opposition to a federal government loan guarantee was highest in Quebec, where 46% said they opposed the plan compared with 21% who supported it. Resistance to the plan in Quebec was based mainly on feelings that the loan guarantee was unfair to Quebec among nationalists and supporters of the Bloc Quebecois.